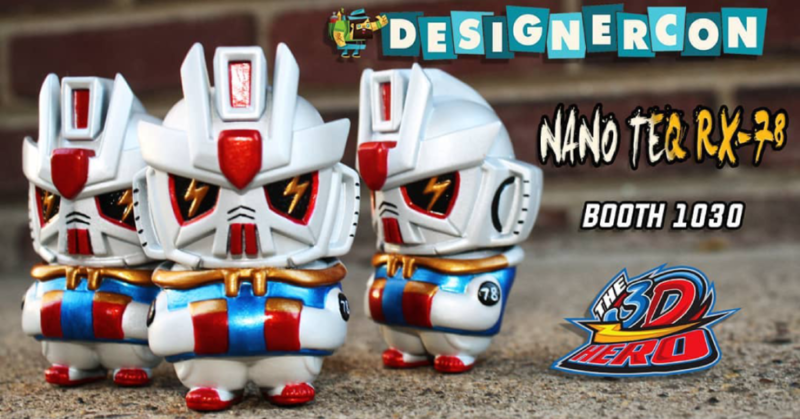 Inspired by Gundam, The 3D Hero is inbound to DesignerCon with his latest custom Nano TEQ RX-78. These hand-painted Quiccs pieces may be small but they certainly pack a punch! You’ll be able to capture these at DCon next weekend from Booth #1030. Joining The 3D Hero at DCon Booth #1030 will be Creeping Death Robot Club, and we’ll have more details soon on what Klav will be bringing to Anaheim next week. In the meantime, go check out The 3D Hero on Instagram HERE to see all his DCon WIP shots. Also you know how the ol’ wise adage goes: if you don’t have a DCon ticket, you’re not getting into DCon! So go buy your tickets to DesignerCon HERE.